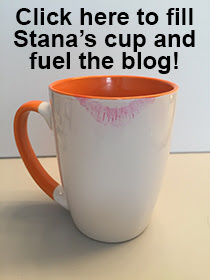 Dear Stana - you will know from my earlier comment that I think this is a lovely name. I always want to tender special congratulations when a name is adopted. It is an act of love for oneself. Thinking of yourself in that name is every bit as compelling an embrace as conferred by the first dress too. Many happy long years to you Stana. Good for you Stana. I was lucky though. I have always been called Stevie, growing up and even today. I did have a sissy friend in college whose given name was Dave. But those who saw his feminine nature called him Davia. That is a pretty name too. Hi Stana! Have fun at the convention! I wish you the very best. If you're not already aware of her, you might want to Google Stana Katic, star of ABC TV's "Castle". She's absolutely gorgeous...and a propos of your women of heights, she's 5"9". I like it! Depending on the pronunciation, it could sound eastern European. On the other hand, it also rhymes with "banana" (kids on the playground could be so cruel)! I am just teasing of course. It still says "Your hostess" is Staci Lana. Is it now going to be Stana Lana? I cannot WAIT to hear your reports from the conference! Wish I were going to Dayton. Maybe a QSO someday on the air.